Corals are formed by minute sea creatures called coral polyps. These creatures form a calcium-based rock like material around themselves. It is this material which we know as coral. The coral grows into a specific formation dependent on which species the coral belongs to. Each coral formation is inhabited by millions of polyps. The polyps vary in size, shape and coloration, according to which coral species they are formed from. In any coral formation, consisting of only one species, the polyps are all identical to one another. The soft coral polyp is basically a sac crowned with a ring of six tentacles (or a multiple of six) surround a mouthlike opening. 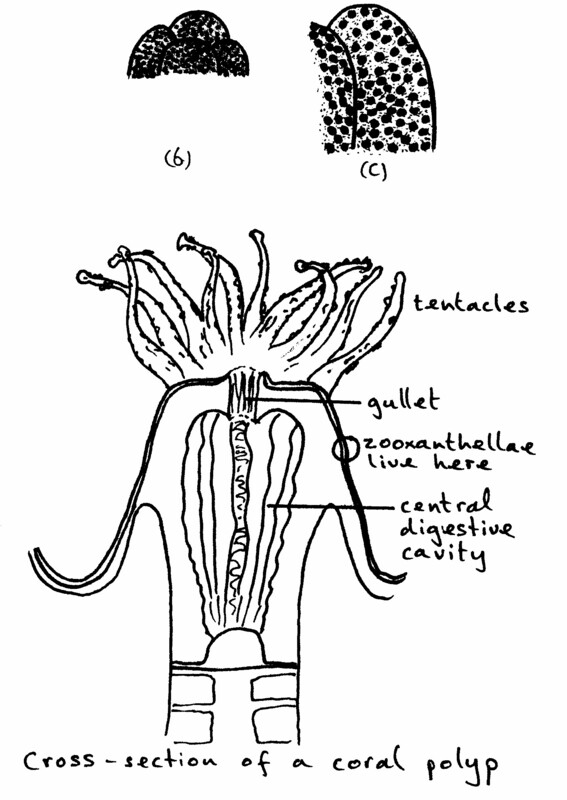 The tentacles have specialized stinging cells that stun animal prey such as microscopic crustaceans. 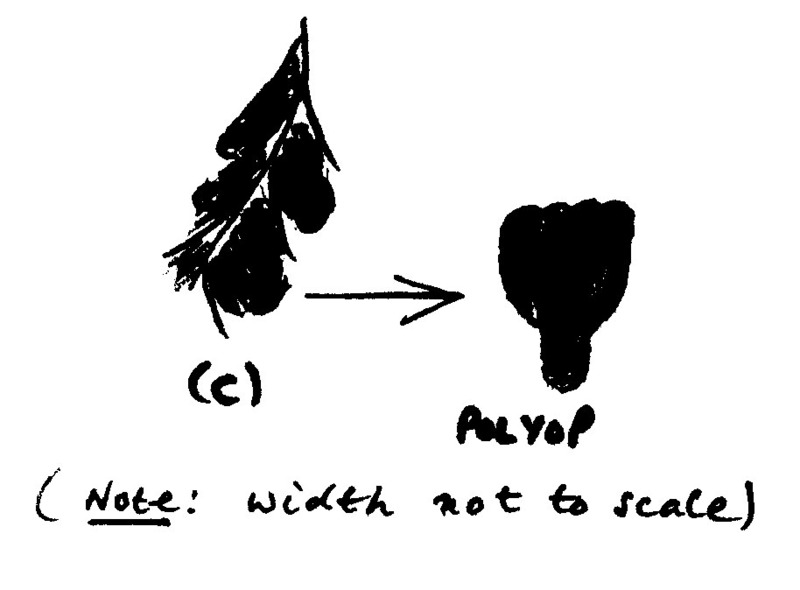 Polyp sizes vary from 1 mm up to 20 cm in diameter. In Abu Dhabi the coral reefs are formed by three major species and an unspecified number of minor species. The remaining 10 percent of the coral reefs are made up of the minority species. So far only a few of these have been investigated. One of them is Lunar Coral or Montrastrea species. This accounts for almost half (5% of the reef) of the minority species in Abu Dhabi. 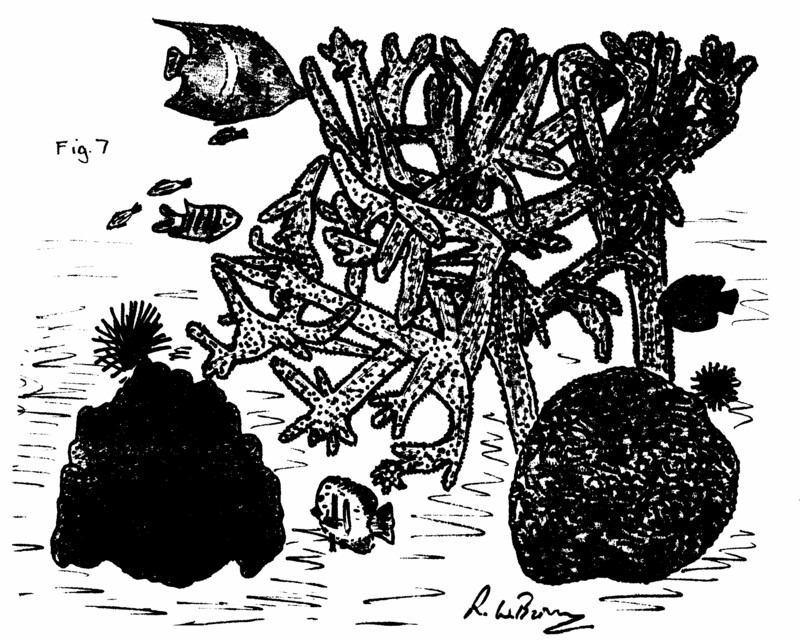 All reef-building corals rely on symbiosis with a unicellular alga known as zooxanthellae, which live inside the cells of the polyps. These algae live, conduct photosynthesis and divide with the host cells, and in this pattern of coexistence the whole biological productivity of the reef ecosystem depends. Because of the necessity of light in the process of photosynthesis, corals rarely grow below a depth of 100 meters. Warm water is also required (above 20'C) as is high salinity and low turbidity. 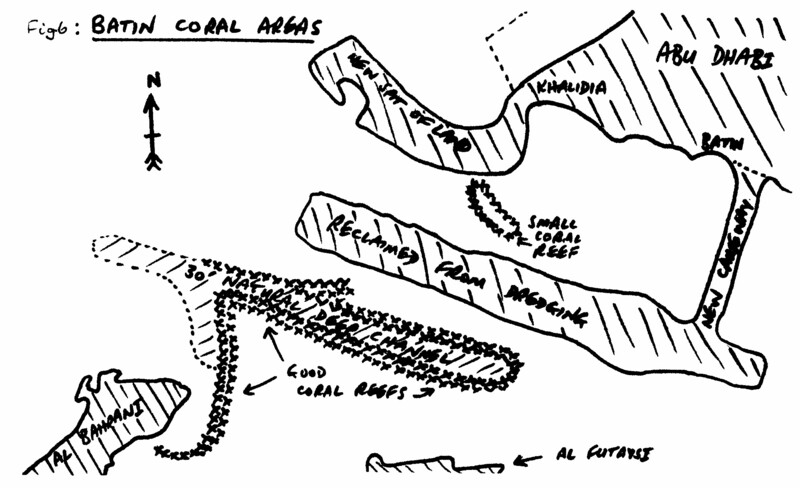 These conditions make the shallow coastal areas of the Gulf ideal for the growth of coral reefs. The main reef builder and most common coral is Staghorn Acropora species. 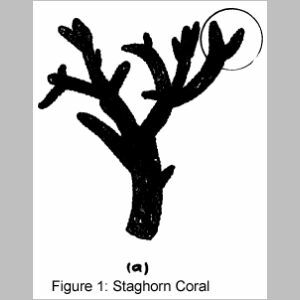 Staghorn consists of branch-like formations intertwined in a clump; refer to the figure 1(a). Many of these clumps grown together to form a large mat or bed of coral a meter or more thick. These beds can be up to many hundreds of meters long and tens of meters in width. The branches of Staghorn coral are very brittle and can often be torn away by rough seas. 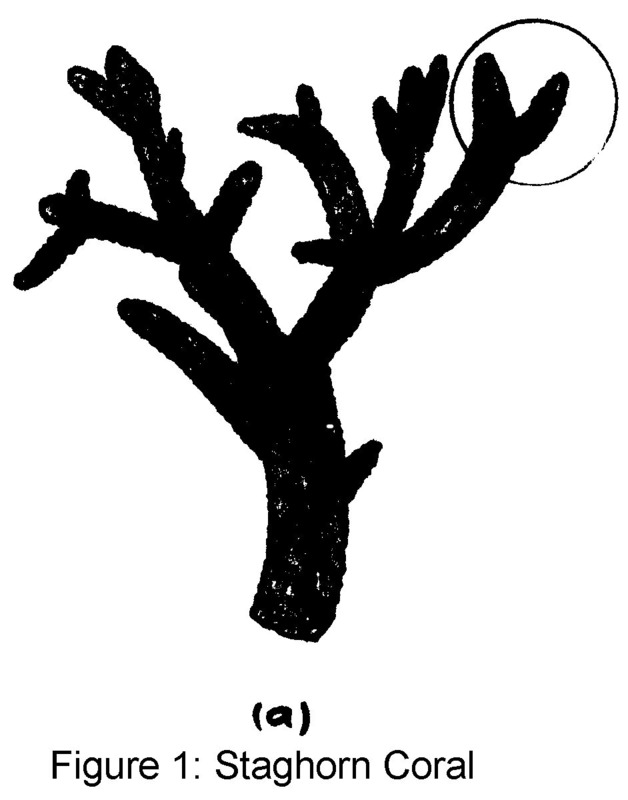 These branches have a sharp pimple-like surface due to the circular coral formations around the polyps (see figure 1b). The Staghorn polyp is very small, of a soft texture and brown in color. It has a tubular body with finger-like tentacles at the top. The mouth of the polyp is on the top at the center of these tentacles. 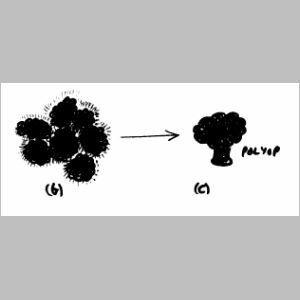 Figure 1(c) shows the general form of the polyp and how they are arranged together. The body of the polyp remains inside the coral shell into which the tentacles can also be drawn at night for safety. The tentacles are used to catch food, extract oxygen from the surrounding sea water, and soak up the available sunlight. These tentacles wave about in the water catching microscopic particles of food which stick to a muscus fluid secreted through the skin of the tentacles. 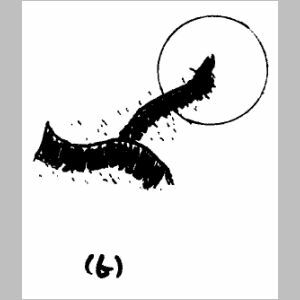 This muscus travels slowly towards the mouth of the polyp carrying the food particles with it. 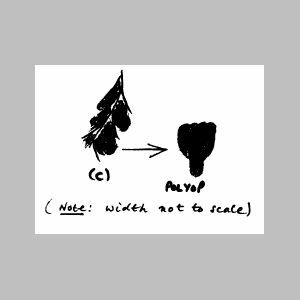 The dimensions of the polyp are approximately: 3 mm in width and 2 mm in length. The next most common coral is Brain Coral, Diploria species. 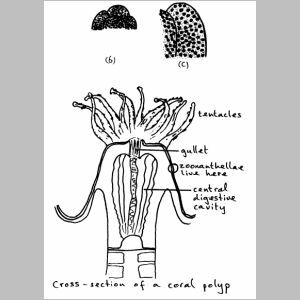 It gets its common name from the way the polyps form ridges in the coral formation, resembling those contours formed in the mammalian brain (see sketch 2a). Brain coral can grow to large sizes of several meters in diameter. Although the main formation of the coral is very dense and hard, the ridges of the structure are quite brittle. These ridges are formed by the coral polyps which grow next to one another and form a three-sided shell around themselves (see figure 2b). The Brain polyp is much larger than the Staghorn variety, but quite different in shape. 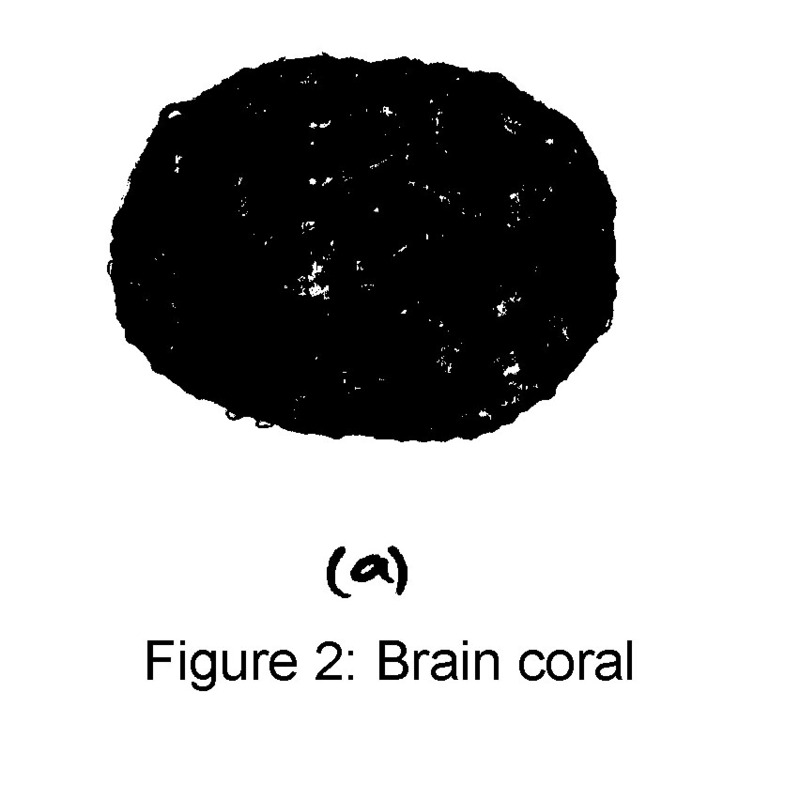 Figure 2c shows the general form of the Brain Coral polyp. 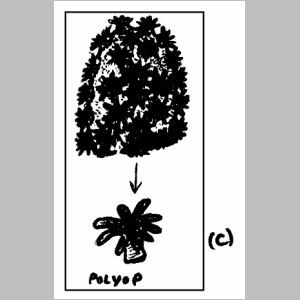 The polyp is in two parts: (a) the cylindrical body that is housed in a hole at the base of the coral ridge, and (b) the fan-like head that fits into the partitioned coral ridge. The mechanism for feeding, etc. 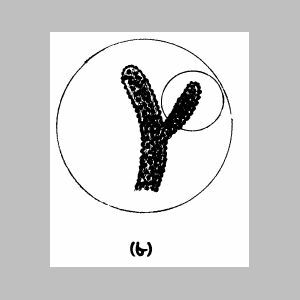 is the same as with the Staghorn polyp. The Brain polyp has a dirty gray coloration. Its dimensions are approximately 1 mm in width and 4 mm in length. Another coral formation quite common in the reefs around Abu Dhabi is Star Coral or Goniastrea species. 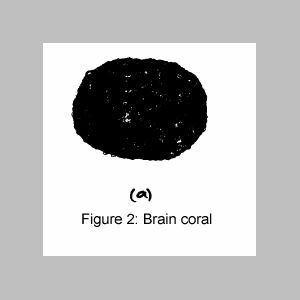 This coral can sometimes be confused with Brain coral due to its overall shape; see figure 3(a). However, upon closer examination the surface formation is quite different. 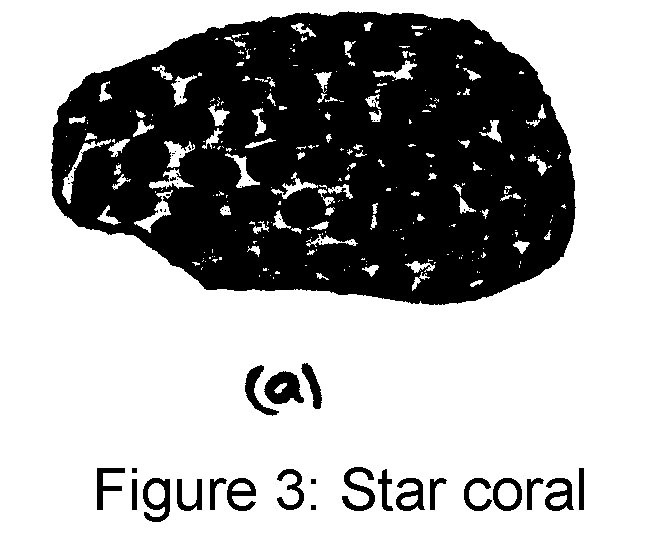 Star coral gets its common name from the shape of the recess in the formation, in which the polyps live. These recesses are quite large and can be up to 1cm in diameter. Star coral formations range in size from about 20 cm up to about a meter in diameter. The polyps of Star coral are very large compared to the other two corals considered. The polyps vary slightly in size with one another but are generally about 0.5 to 1 cm in diameter and about 3 to 5 mm long. 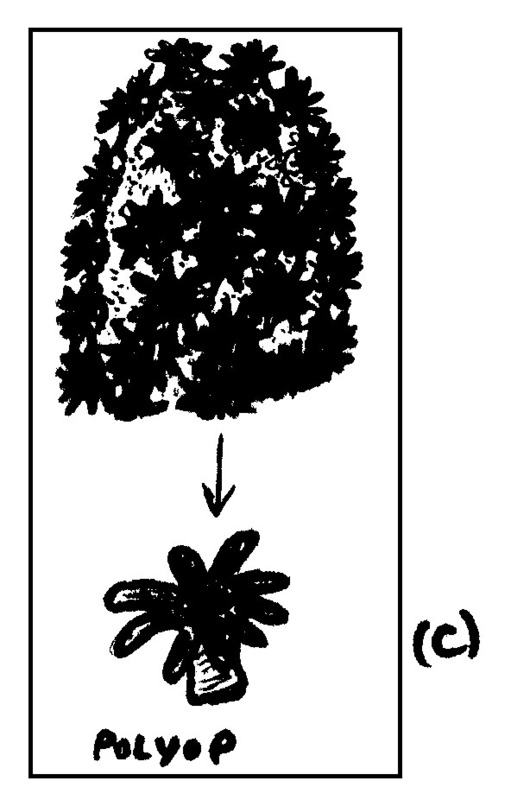 The general form of the Star polyp is shown in figure 3 c.
The polyp fits into the star shaped recess in the coral formation, the cylindrical body being buried in a small hole at the center of the recess. Star coral polyps can vary in coloration and yellow, green and pink formations have been seen in Abu Dhabi reefs. The feeding process is similar to that described for the Staghorn polyp. Lunar coral or Montrastrea species is one of the minority corals in the reefs around Abu Dhabi. 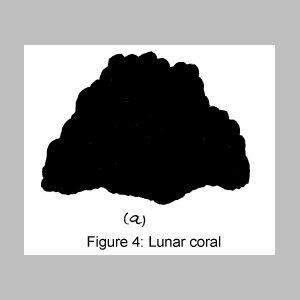 This rather unusually shaped coral formation, shown in figure 4a probably gets its common name from the rather moonlike shapes in which the coral formation grows. The coral formations range in size from a few centimeters up to a meter or so across. The formation attains a deep blue/purple hue caused by the dark blue coloration of the polyps growing in it. 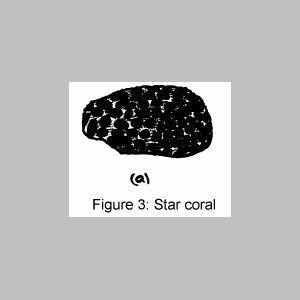 These are very small and appear as specks in the coral surface, see figure 4b. Upon closer inspection, the polyp appears to be round and tubular in shape. 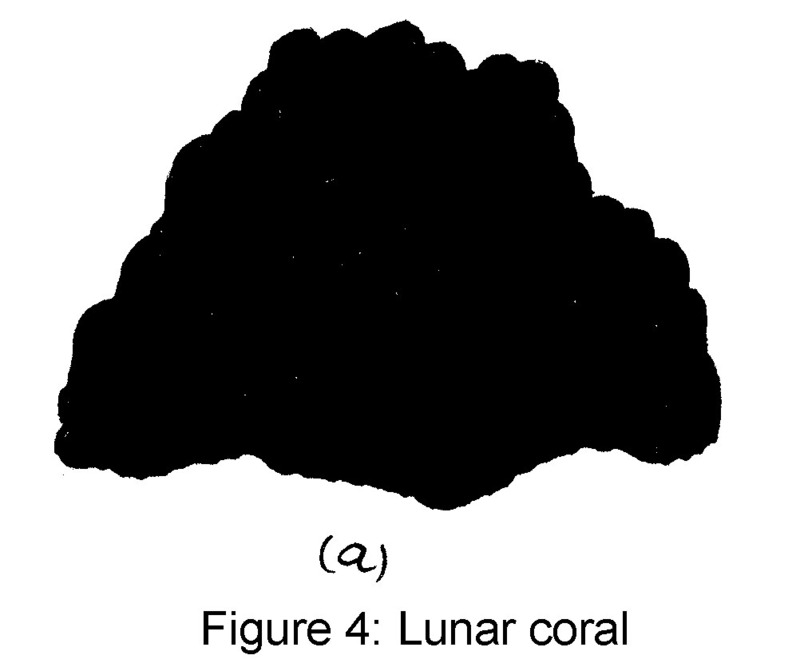 They are deep blue in coloration and are less than 1 mm in diameter; see figure 4c. 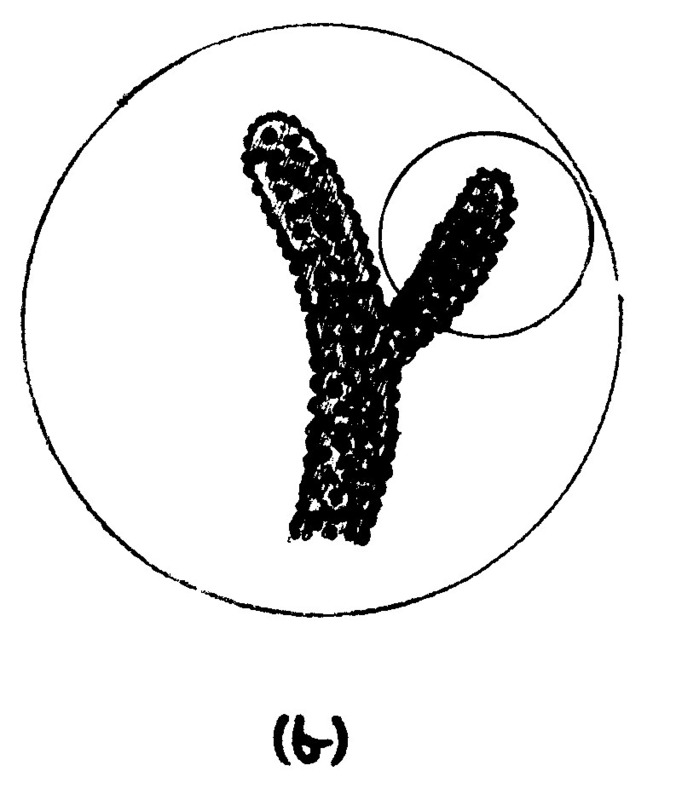 The exact form to which the polyps develop is not readily known. 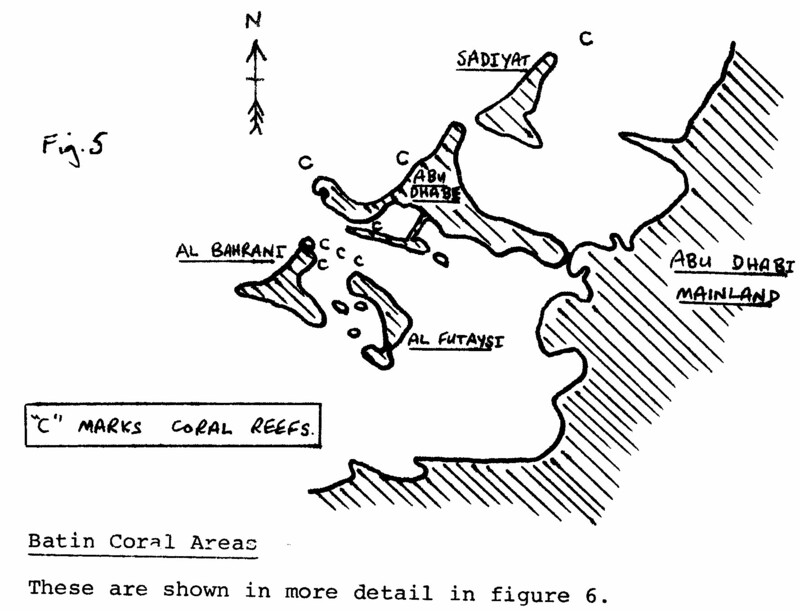 Figure 5 shows the main coral reef areas relative to Abu Dhabi and its surrounding islands. 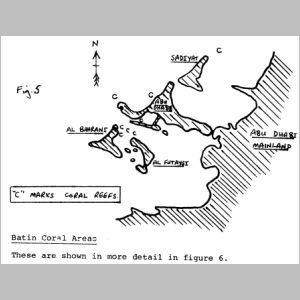 These areas are marked by C. Other smaller reefs exist around Abu Dhabi along with isolated clumps of coral. 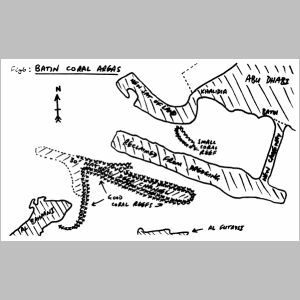 Most of the research, so far, into coral formations has been done on the reefs of the Batin area. 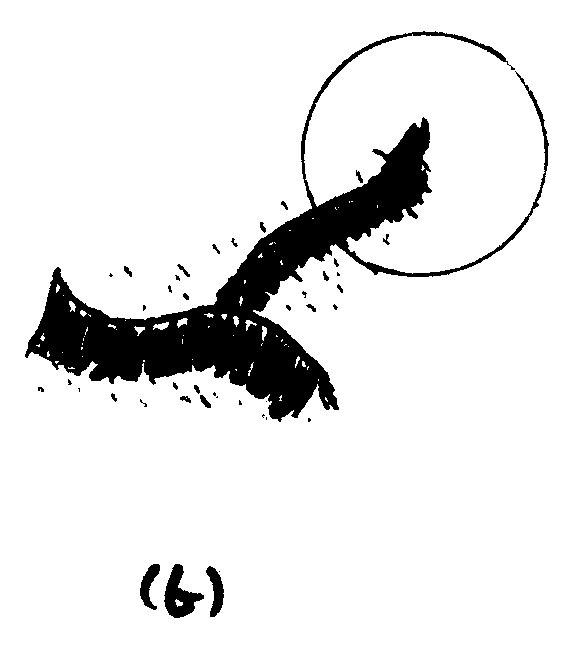 These are shown in more detail in figure 6. Here we see two reef areas. The small one is unfortunately in the process of being destroyed due to nearby dredging operations. Apart from much of the reef being either covered by dredged sand or silt stirred up by the dredgers the tidal flow has been diverted due to the position of newly reclaimed land. This means reduced food and oxygen for the corals to live on. A few clumps of coral with marine fish swimming around them can make a most pleasing sight. Imagine then the breathtaking view presented by a large coral reef extending hundreds of meters in length. This is one of the sights to be seen at the Batin Deep Channel -- total harmony between various forms of marine life -- the perfect ecological system. But it may not be so for much longer. Dredging operations can create some good in that more deep channels are formed which can cause faster tidal current flow which promotes coral growth. However, usually more harm than good results from dredging. Apart from the destruction of the coral reef over which the dredger operates, destruction of nearby reefs occurs due to them being covered by dredged sand and silt. The silt is carried by tidal currents and can affect very large areas of coral by smothering the polyps. Once covered with silt, the polyps soon die from lack of food and sunlight. Areas of perished corals can often be seen near to recently dredged channels to verify this. Everyone will probably agree that progress must continue and no doubt the dredging will, too. If more thought was given to the consequences resulting from the destruction of the local Abu Dhabi marine ecology, surely people would think twice before condemning a coral reef to death. A coral formation grows larger by layers at the rate of a millimeter or two per annum. Each layer is between 1 mm and 4 mm thick, dependent on coral species. Therefore it will take about 20 to 30 years to grow a piece of coral one meter thick. It can be destroyed in hours, possibly minutes, by thoughtless action. When coral dies, fish and other marine life forms move on elsewhere. What about Abu Dhabi's national heritage? The local fishing industry may already be affected. 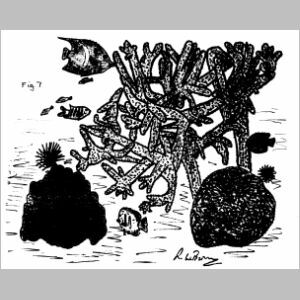 Physical damage and the dumping of sewage both affect reefs, the first by silt-suffocation, the second by the overgrown of algae which supports the development of oxygen-consuming bacteria. In both cases the amount of vital light reaching the coral is drastically reduced. These are problems that are not peculiar to Abu Dhabi. They occur wherever man threatens the marine environment. But at least the study and closer observation of Abu Dhabi's local reefs can contribute to identification of problems and hence possible solutions.